With the Federal Energy Regulatory Commission’s recent approval of the Calcasieu Pass LNG export project in Louisiana and the likelihood that additional U.S. LNG exporting capacity will come on line over the next few years, U.S. natural gas is poised to make significant, global impacts – boosting America’s energy leadership and security, advancing environmental/climate goals and generating trade benefits. Natural gas prices have been a product of abundant reserves in shale, technologies including advanced horizontal drilling and innovations such as the marriage of fracking and horizontal drilling. Thanks to technology and innovation, it’s never been faster to go from drilling a well to producing and delivering natural gas to your home. For example, in the Marcellus shale region of Pennsylvania, Bloomberg reports it takes some companies only about 12 days to drill a well. If equipment and the infrastructure needed to gather, process and transport natural gas is in place, completing a well generally takes only a few days, so in an ideal scenario natural gas can flow to market in as little as two weeks. Since time is money and holding inventories also is costly, the U.S. energy revolution has supplied more natural gas at lower prices. Investors cannot sink billions of dollars into LNG export projects on a lark. They need assurances that reliable natural gas supplies can be made available at costs and volumes that are likely to be economic for exportation, and the business wouldn’t be viable if they were simply taking natural gas that as necessary for domestic U.S. gas markets. Not everyone got the memo, however. Last August a major U.S. chemical producer was saying U.S. natural gas exports would raise prices (subscription) and kill U.S. manufacturing in the process. The same company subsequently delivered strong financial results in Q4 2018, including 13 percent earnings growth before interest, tax, depreciation and amortization (EBITDA). Experience and actions speak louder, so maybe arguments against the benefits of U.S. natural gas exports can be put to rest this year. In 2019, EIA expects LNG exports to grow by another 2.1 bcf/d or 72 percent to over 5.1 bcf/d. The new exports in 2019 are expected to come from Sabine Pass, Louisiana, and Cove Point, Maryland, reaching full capacity, plus startups by the Cameron, Freeport, Corpus Christi and Elba Island LNG projects. 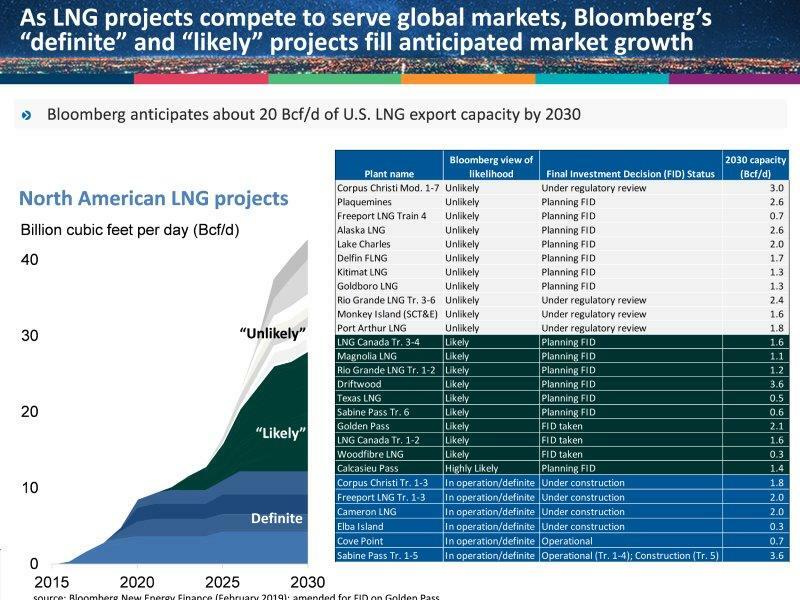 As LNG exports grow, financial markets also can tell us something about how well the U.S. natural gas market is positioned to meet domestic needs and export LNG globally in record and growing volumes. 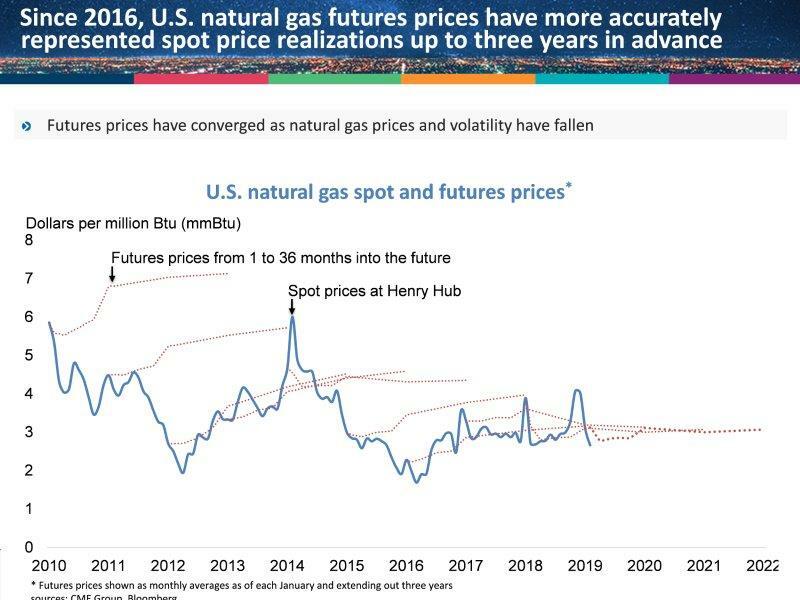 Consider the following comparison of natural gas spot prices at Henry Hub with natural gas futures prices – that is, the fixed price agreed by willing buyers and sellers for the delivery of natural gas at a future point in time. The first thing to note is that futures markets historically have been poor predictors of spot prices. In January 2010, for example, when spot prices were at $5.85 dollars per million Btu, futures prices were above $7.00 per million Btu for delivery two years or more in the future. As the U.S. shale gas revolution was taking off, however, spot prices were $2.70 per million Btu in January 2012 – a 60 percent forecast error – and still falling to their lowest levels in a decade. The pattern of the market expecting much higher prices in the future persisted through 2015. Since 2016, however, futures markets have largely gotten it right and provided an effective means for consumers and producers to secure the prices they’ll pay for natural gas. For example, if a consumer expected prices to increase and bought natural gas futures in January 2016 for delivery of gas in January 2019 at the monthly average price of $3.16 per million Btu, they ultimately paid only 2 percent more than the eventual spot price of $3.11 per million Btu in January 2019. The consumer turned out to be wrong about the price direction, but with all things considered this was cost-effective insurance against a price increase. Conversely, for the producer who sold their gas forward into the future in January 2016, they received funds three years in advance and ultimately got about the same value for their gas. These funds provided them liquidity to develop their business with greater certainty. However, to have sold their gas production forward, the producer must have had confidence production costs would not rise. In this sense, natural gas futures prices are remarkable just now because they remain below $3.00 per million Btu all the way into 2025. 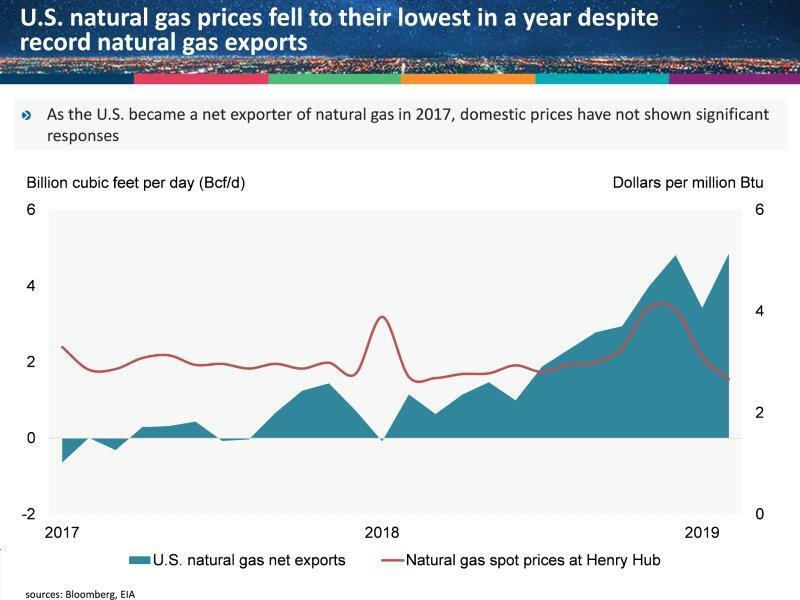 This is a sign of tremendous progress by the U.S. natural gas industry; market confidence that new incremental supplies will come on stream as U.S. LNG exports increase in 2019 and beyond; and, ultimately, a win for U.S. consumers, who have benefited from low natural gas prices and higher economic growth and wages at home with further development of American energy. Next: U.S. LNG helps other nations address their energy and environmental challenges. Dr. R. Dean Foreman is API’s chief economist, specializing in energy and global business. With a Ph.D. in economics from the University of Florida, he came to API from Saudi Aramco Strategy & Market Analysis in Dhahran, where he managed short-term market monitoring and the long-term oil demand outlook. Foreman has more than 20 years of industry experience in corporate strategic planning, forecasting, finance / risk management and regulatory policy at ExxonMobil, Talisman Energy and Sasol North America.